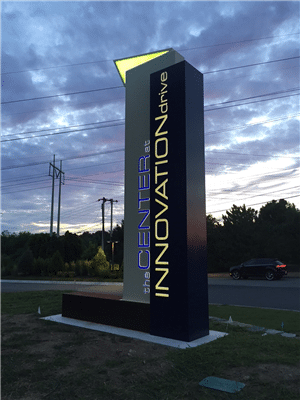 If you’ve been impressed by the design of the freestanding illuminated sign at the Center at Innovation Drive in Tewksbury or the external building sign at Marcou Jewelers in Waltham, you’re not alone. The US Sign Council recently selected both signs as winners in its 2016 USSC Sign Design Competition. The award-winning signs will be featured at Sign World International, and the USSC Awards will be presented at that event, held in Atlantic City in December. Of course, they’re always on display in Tewksbury and Waltham. What goes into creating an award-winning sign – or any sign that’s worthy of a double-take? Metro Sign & Awning’s team of experienced and creative design and fabrication professionals aren’t satisfied to just deliver a sign to spec. They take pride in learning about new and innovative materials and perfecting cutting-edge techniques, with the goal of delivering the best sign, for every client, location, and application. See more in our portfolio, or contact us to discuss a new or upgraded sign for your business.